During the month of September a lot of artwork has come and is starting to really fill out the content for the main storyline of the game. 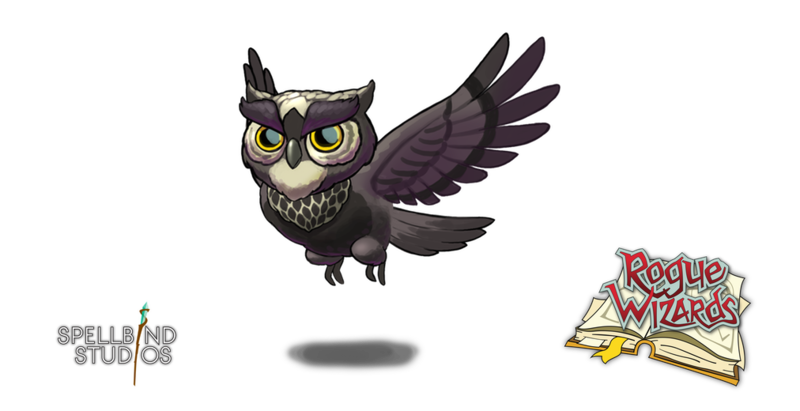 Alex has completed the final artwork for the Owl pet and now he’s ready to be animated. We’re still not quite sure what kind of help or abilities the pets are going to have, but we’re looking forward to your ideas and feedback as the alpha and beta programs start in a month or two. We’ve also spent a huge chunk of time getting some new environment visuals online, but they’re not quite ready to show yet; So we decided to give you a little behind the scenes look at the tech used to create the environment and game world. 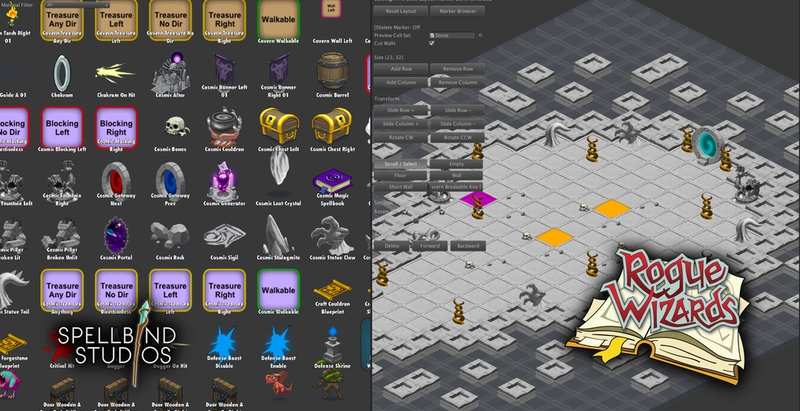 Below is a screenshot of how all the 2D images are laid out in the 3D game engine Unity. Normally the camera is looking straight on the images making the set of 2D images appear to be 3D due to the forced perspective in the art. However, here we’ve altered the camera perspective and position so you can see what the world looks like when viewed from the side which just a bunch of 2D perfectly flat images. Although most of the environment is built by the random generator, we also have a set of tools that allows us to create small pockets of a level using a hand placed layout. 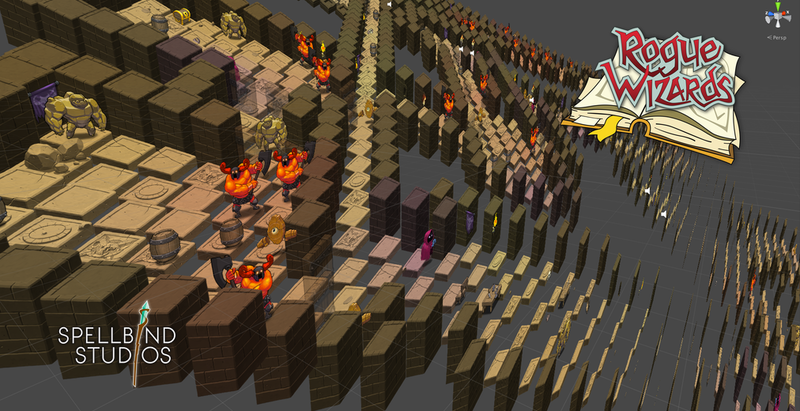 This screenshot shows a small arena we’re building for a boss battle in the Rift of Fire using hand created placement for floors, walls, and all deco objects that can then be inserted into a larger level by the random map generator. – When NPCs in town have multiple new unread dialog, the dialog is now auto-batched up into one since seamless display in the dialog UI one after another. – Simplified the text message displayed when using an exit portal in a dungeon. – Items that cannot be picked for any reason now flippy to adjacent cells if the cell they reside in contains more items that can be picked up. This allows you to move a material out of the way and pickup gold or a weapon that is sitting under it. Note that shuffing the material to the bottom of the item pile is not sufficient because materials are always Z sorted on top of other items cause they float. – Added grayscale flame for torch to try out in the cavern, tried it, didn’t like it … but leaving the images there for future use that might be cool. – Moved dialog audio code into DialogManager which is now shared between town dialog UI, dungeon dialog bubbles, and cinematic text display systems. – Fixed all quests not being a part of the master list and not being able to re-load after completing them due to property resolution. – Added story quest names and descriptions. – Fixed timing on TownIntro timing releated to dialog completing, since the dialog is now completed when the last line is displayed … a new event called DialogUIClosed has been created for this intro quest to use in order to show the opening cinematic as well as any in world instructional/tutorial text and logic. – Refactored the Background API so that Cell.ChangeCellSet() can now properly handle changing the background images of a cell when it is already instanced as is the case in the tower map when structures are built and they change the background images of the cells they reside on as well as surrounding cells. – Completed the debug tools to auto advance the player to the next story state. Any relevant map changes, dungeon closing, quest instancing, and quest completion is automaticially done for you. This tool his hooked up in the home menu and the Control+Q menus hotkey. – Story dialog is now retrieved in such a way that you can never miss previous conversations with town inhabitants, even if the game state has moved on and given them something new to say first you see the old dialog then the new dialog. October 2, 2015 in Rogue Wizards.